It is well known that animals and robots can sense and navigate obstacles using sensory feedback. However, while moving rapidly in a terrain with large, complex, 3-D obstacles sensing and planning are often impossible due bandwidth limitations, and the animal or robot physically interacts with obstacles in the environment. By studying rapid traversal in which there is often collision with an obstacle due to sensory feedback limitations, it is possible to discover general mechanical principles of obstacle traversal. Here, in the second of our two companion studies, we studied traversal of a large bump obstacle by a legged animal (discoid cockroach) and robot. We found that the animal ran rapidly towards, and often collided with the bump, but still remarkably traversed a bump 4 times its hip height at speeds higher than its walking to running transition. Similarly, the robot could traverse a bump 3 times its hip height at speeds higher than its walking to running transition. Additionally, even though the obstacle was simple, when the animal and robot encountered a large bump obstacle they displayed multiple locomotor modes like pitching the body and climbing or turning laterally and deflecting (see the videos below). 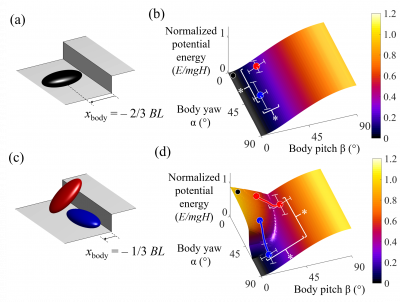 To explain the observed locomotor modes, we developed a locomotion energy landscape model to explore how body-bump interaction affected traversal (see the video below). The locomotion energy landscape model showed that there was a large instability in the yaw direction when a body collided with the bump at larger yaw angles (figure 1). Additionally, it showed a pitched down body was more stable in the yaw direction (figure 1). These observations from the landscape helped explain why deflection was more likely when the animal and robot encountered the bump with a laterally turned, pitched down body orientation. Figure 1: An energy landscape explained bump traversal modes. (a) A body approached the bump. (c) A body climbed (red) or deflected laterally (blue). The energy landscape prior to (b) and during (d) body-bump interaction. Average initial body pitch and body yaw are shown for animals that climbed (red circles) and animals that deflected (blue circles). Similar to our companion study, we added an active tail that pitched the robot upwards so that it avoided the large laterally instability discovered in our energy landscape model. Activating the tail increased the maximal traversable bump height by 75% (figure 2). 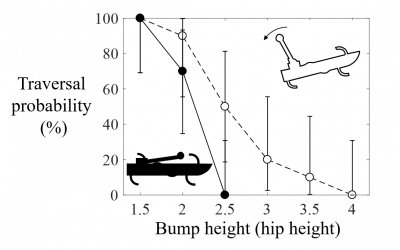 Figure 2: Activating the tail to increase body pitch increased traversal performance by 75%.